A Superintendent of Police and a DSP were among nine policemen injured on Sunday when Jat protesters clashed with them on being prevented from marching toward Delhi. The protesters also set fire to two police buses during the clash that took place in Dhani Gopal village on Sirsa-Hisar-Delhi national highway. 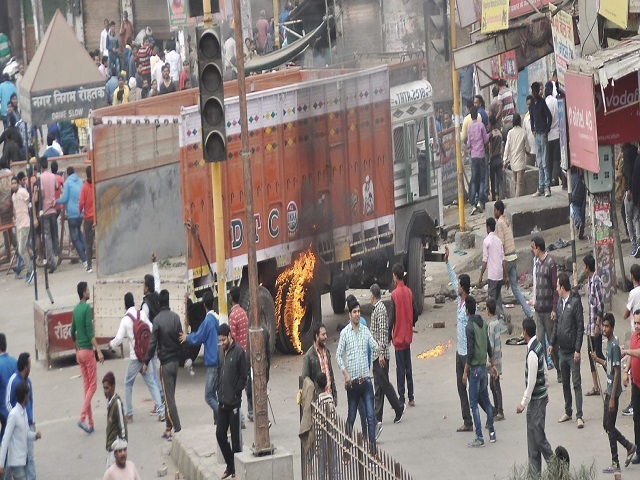 The situation turned tense when Jat Quota Stir protesters from villages of Chamarkhera and Kheri of Hisar district tried to enter Fatehabad district to join dharna at Dhani Gopal. Tractor trolleys carrying Jat protesters tried to breach police barricades. DSP Gurdial Singh, who was deputed at the barrier, requested them to go on foot and join the dharna peacefully but the protesters did not relent, police said. Later, some miscreants pelted the police party with stones. Retaliating, policemen resorted to lathi charge. Nine policemen were injured in the clash and the protesters torched two police buses. SP O P Narwal suffered an injury on his hand. DSP Gurdial Singh, Inspector Kuldeep, ASIs Sadhu Ram, Sohan Lal, Major Singh, Daya Ram and Krishan were also hurt, police said. The Protesters also scuffled with media persons. They allegedly deleted videos and photos of the incident from their cameras and damaged their equipment. The newspersons later filed a complaint with police, demanding action against Jat agitators.